Last week we pointed out that when it comes to Article 13 both the version discussed (and since adopted) by the Member States in the Council and the compromise proposals discussed in the European Parliament’s JURI Committee are pretty terrible. In light of the negotiation mandate adopted by the Member States last week the only real option preventing mandatory censorship filters from becoming a reality for internet users in the EU is the European Parliament’s adoption of a position that renounces such filters, or (at the very least) ensures that any efforts to filter respect the fundamental rights of EU internet users. Unfortunately, the direction of the discussions in the JURI Committee clearly point toward an EP position that would support mandatory upload filters. In this situation, it is important to remember that for almost a year, the European Parliament has been sitting on an opinion from the Internal Market and Consumer Protection (IMCO) Committee that would limit the negative effects of Article 13. Since then, the text of the IMCO opinion, adopted on the 8th of June 2017 (! ), has also been adopted by the Civil Liberties (LIBE) Committee. The IMCO/LIBE text is a substantial departure from the flawed logic of the Commission’s proposal. Instead of trying to force all open platforms, regardless of their business models, into collaborating with rightsholders and deploying upload filters, the IMCO/LIBE text tries to differentiate between activities of open platforms that are covered by the liability limitation of Art 14 of the e-Commerce Directive (ECD) and activities of platforms that are not. All further provisions of the IMCO/LIBE version only apply to those activities of open platforms that are not covered by Art 14 ECD. These provisions still contain an obligation to obtain licensing agreements (for services that are not covered by Article 14 ECD this is nothing new) and an obligation to “take appropriate and proportionate measures to ensure the functioning of licensing agreements concluded with rightsholders”. This is a toned-down version of the filter language in the Commission’s proposal. 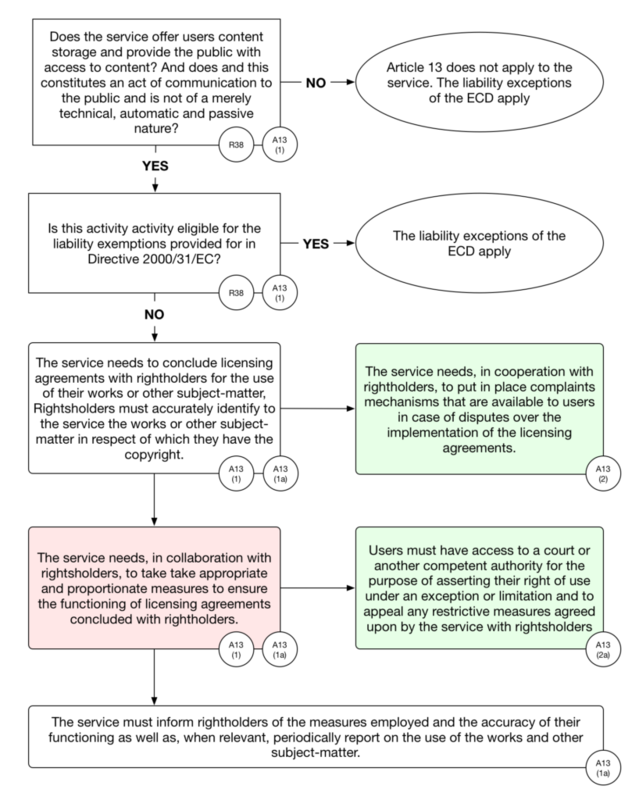 In the IMCO/LIBE text this requirement is counterbalanced by requirements on the platforms and rightsholders to “put in place complaints mechanisms that are available to users in case of disputes over the implementation of the licensing agreements” and an explicit requirement that users must be provided with a possibility of “asserting their right of use under an exception or limitation”. The LIBE/IMCO approach is much more reasonable and would have a smaller impact on the freedom of creative expression in Europe. Stripping away the liability protection that has allowed a wide variety of online platforms to flourish (as proposed by the Commission and now backed by the Council) is guaranteed to cause substantial collateral damage to the digital economy in the EU. Adopting a text based on the IMCO/LIBE language the European Parliament could offer a real alternative that is much more targeted in its application. Instead of burdening a wide range of online services with filtering requirements it would make additional measures for online platforms dependent on a case-by-case assessment of the nature of their activities. Given that the discussion of the compromise texts proposed by MEP Voss in the JURI Committee seems to be stuck, reverting to the IMCO/LIBE language might offer a way out for MEPs. If, on the other hand, MEP Voss and his backers insist on the approach they have followed so far, the IMCO/LIBE language could be a basis for an alternative compromise backed by MEPs who refuse to give in to the demands of rightsholders and care for the rights of EU internet users and creators. Let’s hope that MEPs realise that this alternative option exists before it is too late. This entry was posted in EU policy and tagged article 13, copyright, copyright reform, digital single market, eu-policy, European Parliament, fixcopyright, IMCO, LIBE, upload filters, users rights. Bookmark the permalink.